The ties that bind fantasy football and investing. Each summer my friends and I get together for our annual fantasy football draft. We each put on our general manager hats and try to implement our draft strategies. Certainly there is a lot of luck involved in fantasy football but it's amazing to me how the good managers consistently land near the top and the poor managers sink to bottom. To draw on the parallels of fantasy football and investing, let's first think of fantasy football in the context of an auction draft. We have a certain amount of money (usually $200) to construct the best team possible. The objective is to score the most points by buying players with the best value (points/price). Below I have compiled a list of the 10 running backs with the highest auction values going into the 2013-2014 season. 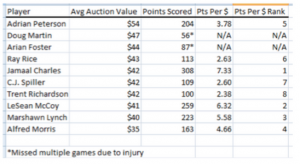 I then added a Points Scored Per $ Ranking to show which players were the best bargains. As most football fans know, Minnesota Vikings running back Adrian Peterson is a phenomenal running back. Injuries aside, he been consistently great and that's why he is so sought after by fantasy football owners. With all that being said, he turned out to be a mediocre value last season. Investing Lesson: There is a difference between being great and being a great value. I often find that the best companies are not a great value because everyone knows they are great. I could not think more highly of Google (GOOG), but I've never purchased their stock because it doesn't have the value I'm looking for. On the other hand, Kansas City Chiefs running back Jamaal Charles was the best bargain among backs last season and I was one fortunate beneficiary. In hindsight, Charles had all the signs of an undervalued player. In 2012, Charles averaged a terrific 5.3 yds/carry but only found the end zone 6 times. In 2013, a better coach, better quarterback, and a soft schedule following a 2-14 season helped Charles score 19 touchdowns. A running back can control how far he runs on each carry, but he has less control over his number of scoring opportunities. Investing Lesson: When examining companies, I try to judge their past performance on factors that were within their control. For example, a manufacturing company may have limited control over their raw material costs. Will their misfortune one year, flip the other way next year? Finally, let's consider Arian Foster, a running back with the Houston Texans. I did not value Foster in the chart since he missed half of last season due to injury. Foster was the 3rd highest scoring running back in 2012, so why did I drop Foster from my keeper league in 2013? Foster took a pounding in 2012 on 391 touches and his career low 4.1 yards per carry ranked 21st among running backs. He also entered 2013 with known back pain that ultimately derailed his season. Investing Lesson: Understand the life cycle of the industry a company operates in. What are the warning signs for problems? Don't look at rising net income and assume everything is okay going forward. Is a retail company aggressively expanding while same store sales plummet? Two more things to consider: Ignore media hype and do your own research. Since there is little sports news to talk about during the dog days of summer, ESPN will inevitably spend 90% of their airtime talking about a player they love. Later, fantasy sports analyst Matthew Berry will come out with his list of sleepers, who eventually become overvalued because everyone picks them as their sleepers. Do your own research and forge your own path. Famed Fidelity Investments fund manager Peter Lynch was a master of this concept. He looked for companies with boring names and little analyst coverage. Fertile ground is found where the stampede has not yet trampled. Every year it seems that one or two players in our fantasy league will load up on players from his favorite NFL team. This almost always leads them to being the worst in the league. Beginner investors often make this same mistake. They invest because a company sells their favorite product, or is located locally. Worse yet, they invest in their employer's stock to show loyalty. The stock market is a secondary market. If you overpay for a stock, the only person who benefits is the person who sold it to you. I hope this article helps bring context and clarity to your investment decisions whether it is Lockheed Martin (LMT) or Doug Martin. 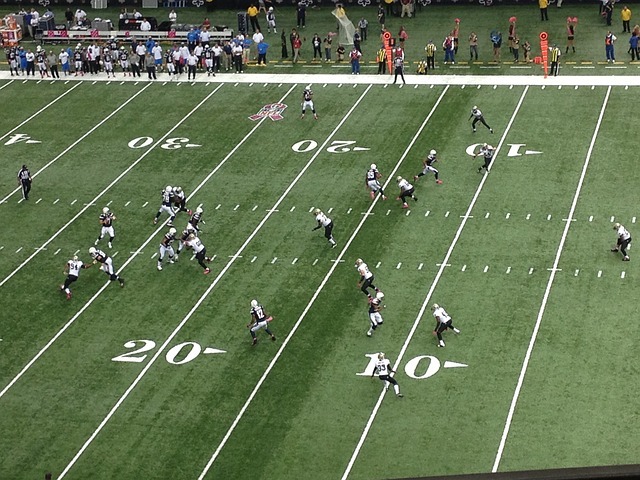 The post Investing lessons from fantasy football appeared first on Smarter InvestingCovestor Ltd. is a registered investment advisor. Covestor licenses investment strategies from its Model Managers to establish investment models. The commentary here is provided as general and impersonal information and should not be construed as recommendations or advice. Information from Model Managers and third-party sources deemed to be reliable but not guaranteed. Past performance is no guarantee of future results. Transaction histories for Covestor models available upon request. Additional important disclosures available at http://site.covestor.com/help/disclosures. For information about Covestor and its services, go to http://covestor.com or contact Covestor Client Services at (866) 825-3005, x703.